Researchers from the Swiss Space Center at EPFL recently announced plans to launch a miniature satellite into orbit in 2014 that will get close to and grab an existing small satellite currently in low earth orbit and bring it back to earth where it will be burned in the atmosphere upon re-entry. Researchers are hoping that the new type of spaceship will open the door to a new generation of satellites specially designed to clean up space debris. Earth’s orbit is filled with thousands of space debris of different sizes. NASA keeps track of about 16,000 space objects larger than 10 cm in diameter. Most of these orbiting debris are jettisoned rocket parts and satellite components which are considered a growing space hazard. If a satellite happens to collide with one of these floating space debris it can create a great deal of damage which can destroy the satellite and create even further debris as a result. Space debris are no longer just a theoretical risk. On February 2009 the U.S. satellite Iridium-33 exploded after it was hit by an old Russian satellite -Cosmos-2251. The consequences of these collision was enormous, not just because of the lost satellite but insurance costs have also spiked, making launching new satellites into orbit more expensive than before. 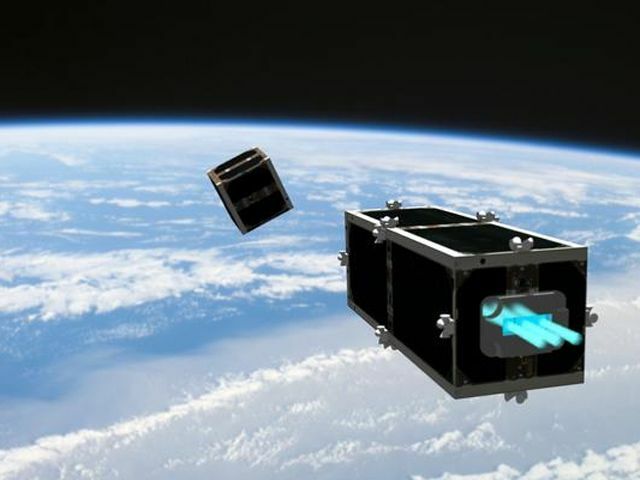 CleanSpace One is being developed to combat this growing risk of space debris. Its first target will be symbolic for its developers – either Switzerland’s first orbiting object, the Swisscube pico-satellite (launched in 2009), or a second Swiss satellite named TIsat (launched in 2010). CleanSpace One will have to adjust it course and speed After its launch in order to get close to its target. to do that it will use a new type of ultra-compact motor designed by researchers in the EPFL laboratories. This will not be a simple endeavor traveling at speeds of 28,000 km/h at an altitude of 630-750 km. 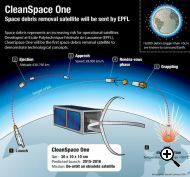 CleanSpace One will have to grab its target – a complex operation especially if the target is rotating. In order to accomplish this EPFL researchers are working on a gripping apparatus inspired by nature. After CleanSpace One will successfully grab its target it will de-orbit it, burning both the target and itself upon re-entry. 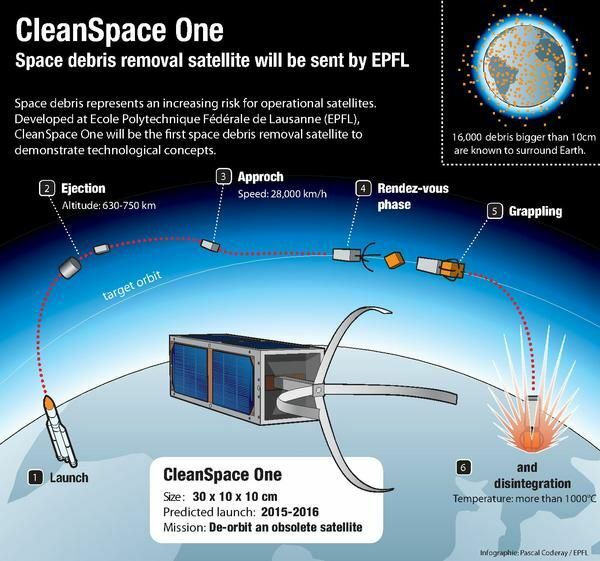 In the future EPFL is hoping to sell more advanced versions of its CleanSpace satellites to companies around the world so they can get rid of satellites which ended their operational lives or have stopped working and make room for new ones. The question remains – who will clean all of the existing space junk floating around and risking our satellites? You can watch a video describing the project on the following link. More info can be found here.